It is a cold, dark April day and it feels like February. 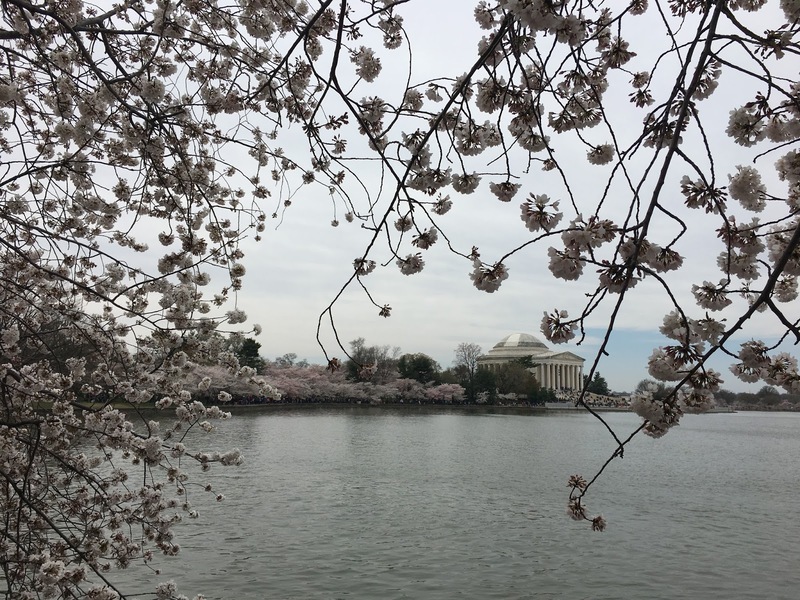 Though it is hard to think Spring on a day like today, it will eventually feel like Spring, and hopefully we will finally be able to put away our cold weather clothes. 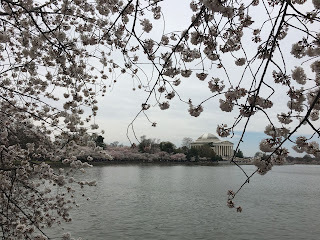 I know many of you have probably gotten the Spring cleaning itch, which for many of us includes going through our clothes, and other household items and donating or selling things that don't speak to us anymore. I do think many of us get the Spring organizing bug because we have spent many months inside and now it is an opportunity to throw open our windows and not only bring more light in, but make our rooms feel lighter. Spring also represents a time for a restart to not only get our homes in order, but to refocus on goals that are important to us. I contributed to an Alexandria Living article on this very topic. Another way to make our homes feel lighter is to process paper daily, or several times a week. Better yet, keep it out by getting e-statements and utilizing services, a good one is DMAchoice, to get off of junk mail lists. Spring time is a great time to go through files and put together a few bags of documents to be shredded. Take advantage of the many free, Spring shred days in our area. A good one is sponsored by my bank on April 21st from 9:00 - noon, Commonwealth One Federal Credit Union, on Eisenhower Avenue. It is open to the community and you don't need to bank there. Happy Spring and happy organizing! I created a mess all over my kitchen floor when I reached for a set of measuring spoons and along with them came an assortment of monster straws, that my kids had long aged out of, taking up valuable real estate in my kitchen drawer. I decided right then this drawer was first up to try out my claim that mini organizing tasks can be done in 10 minutes or less. I first took everything out of the drawer and sorted it into donate, keep and trash. I ended up with a decent size bag of stuff we don't use to give to the Green Drop and a few items were broken so they went in the trash and the remaining keep items, I sorted into categories. 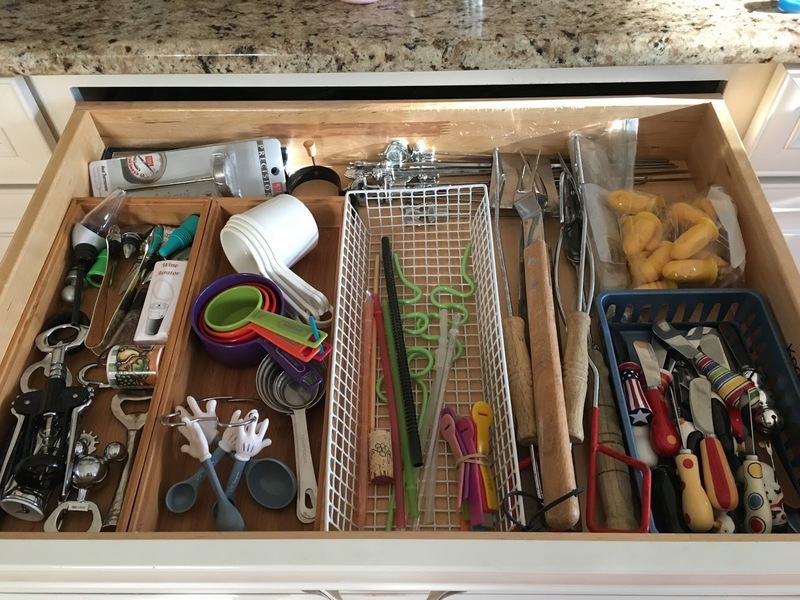 I cleaned out all of the gunk and crumbs that collect and seem to multiply in utensil drawers, and then put all of the items back in their respective categories. I went slightly over 10 minutes, but I now have a drawer that we go in frequently that is clean, organized and not over-stuffed. 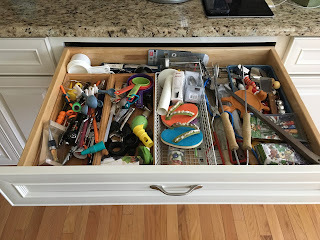 One drawer at a time, it can get done! The not-so-fun tax documents are starting to come in and it got me thinking about my files and papers and how I need to get them organized for 2018. Yup, I haven't done it yet! What I did do a few years ago though is some big picture organizing of all of our family's important documents and I created a road-map to explain the how, what and where to manage it. We all know how important it is to have our critical life documents in place, so that we have them when we need them. However sometimes life gets in the way and this important task gets pushed to the back burner. Working with an organizer can help you check this important task as done. Having a professional guide the process makes it less stressful and painful. However, there are helpful checklists out there for you to do it yourself. The website Get your SH** Together has several. It is critical to gather all important documents such as wills, insurance, marriage and birth/death certificates (follow the link above for the complete list) and to ensure that important people in your life know where to find them. Gather them all in a secure place and make sure they are updated and protected so that if you need them, you have them. Road-map Creation - It is essential to set up files and to have a document that reminds you and informs the important people in your life where all the essential documents are kept, how to pay bills, contact information for key people, and how to find passwords so that a stressful situation doesn't become more stressful for a loved one trying to get essential information, if and when you can't. There are 6 elements to create a Road-map for yourself and loved ones. Insurance - In order to make sure you have the right insurance and that you can get items replaced if you need to, you will need to do a home inventory. There are many home inventory software companies out there that make this process easy, and a good one is HomeZada. Though even a video and spreadsheet of items and model numbers by room would suffice. Check with your insurance company and find out their requirements. Important Paper / Files - Only create paper and electronic files that are absolutely essential. Create an index of what is filed where to include instructions to find digital paper. Income / Expense - Create a spreadsheet to describe all assets and all expenses, to include how all bills are paid. If paid on-line - explain if the bill is paid from a checking account or charged to a credit card. Passwords - Do your loved ones know your essential passwords? Do you use a password manager? Share with your spouse and others as appropriate your master password, computer lock-screen password, bank accounts, credit cards, etc. I can't tell you how many couples I have worked with where they don't know each other's important passwords. Contacts - Create a list of important people in your life that can help answer questions (accountant, financial advisor, executor, home maintenance providers, etc) and also friends, neighbors and family you want contacted in an emergency situation. Safe Deposit Box / Fire Proof Safe - Create an index of what is stored here and make sure your loved ones are aware of it and know the code to access the safe, or have a key to a bank safe deposit box. You will want to put the Road-map document here for loved ones to access and you can also send them a copy, as you feel comfortable. The sense of satisfaction and relief are tremendous when the road-map is complete. I know paper can be overwhelming, but there are a lot of resources out there - both good websites with checklists and professionals that are available to help at any point in the process. Good luck creating your family's road-map and let me know if I can assist. There is so much information how setting broad goals isn't the way to go, to meet New Year's resolutions. If you truly want to make change, the way to go is to set small, specific goals that are doable and realistic that move you towards achieving your broader goals. Resolutions are about change and making any kind of change, especially if it requires forming a new habit, is challenging. I read an article a few days ago about Jim Webster, a chef and food journalist, who lost 60 lbs by wearing his Fitbit faithfully, and not eating for 12 hours after his last meal of the day. As a chef, he is around food all the time and needs to test what he is making, which can wreck havoc on any weight loss plan. He realized, in his line of work, to achieve his weight loss goal he couldn't follow a rigid diet plan, but he could focus on what he could do, walk more, watch what he eats and not eat after a specific time. He found success and continues with this lifestyle. Many people realize the importance of organization and define getting organized as one of their New Year's resolutions. The problem is getting organized is a broad goal and can be too daunting especially if there is a backlog of clutter. Once normal life resumes post holidays, those great intentions sometimes fall by the wayside. 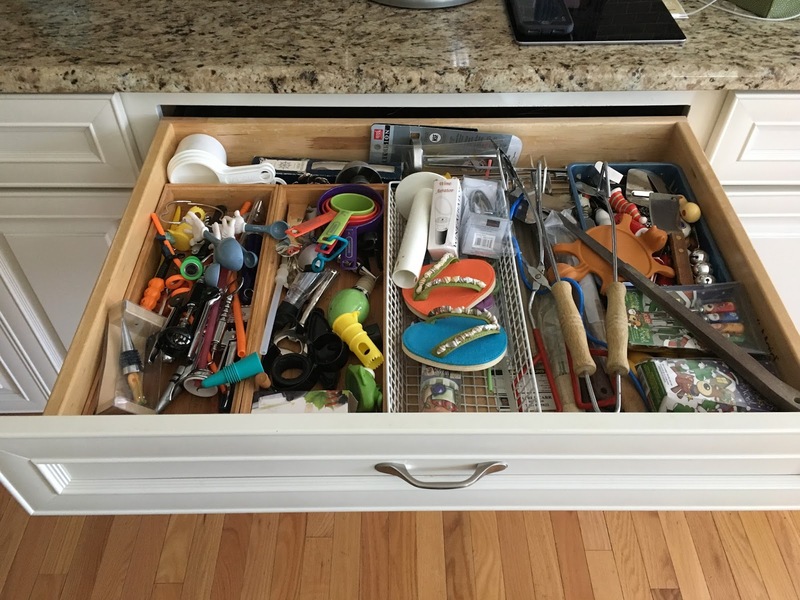 A better way may be to focus on one small organizing task, like a junk drawer, or entry way table that won't take a lot of time to get in shape, but will still give the emotional lift and sense of accomplishment that something was done towards your goal of getting organized. As I went to reach for a water bottle yesterday and an avalanche of water bottles fell out of my pantry, I realized my 10 minute project was identified for me. The problem was easy to diagnosis - too many water bottles. We have a home for the water bottles, however it had gotten messy and several of the bottles couldn't fit so they were haphazardly thrown in the storage container. It took 10 minutes for me to take the storage container out, weed out the bottles we don't use, take out the travel coffee cups (moved them to the mug cabinet), and now all of the water bottles with lids fit neatly in the storage container in our pantry. You would have thought I achieved something so wonderful by the lift and sense of accomplishment I felt. I truly believe that in short, regular scheduled time increments goals can get accomplished. I'll keep you posted on other 10-minute organizing blitzes I accomplish. Here's to getting it done this year! Why the hiatus from writing? Like most people I too procrastinate and push things of lesser priority, or I don't want or enjoy to do, to the bottom of my to do list. It hasn't been top of mind for me. However, with Thanksgiving on Thursday (how can that be?! ), I thought I'd break my blogging fast to express how grateful I am to all my clients - those who have been with me for many years and those who are new clients. I am privileged to meet so many great people, and while I am hired as the organizing expert, I find we learn from each other. I sometimes take for granted the positive feeling I receive when a client is so excited about an outcome of a finished project, or seeing a client who was overwhelmed at the start of the process, be happy and content as a project wraps up. I get so much joy contributing to the process and am grateful for the opportunity to do what I do. May this Thanksgiving bring joy, and continued feelings of gratitude for all that we have in our lives to carry us through the busy holiday season and end of year. Happy Thanksgiving! Hopefully, you have been able to take advantage of many of the document shreds in our community this spring. Whether you save up your shredding and shred in bulk, like I do, or shred as you process your mail, there would be less to shred, if you only receive mail that you need to receive, instead of receiving junk mail. However, with a little work, you can significantly reduce or eliminate all unwanted mail from your home by utilizing some apps, services or contacting paper reduction/preference organizations. PaperKarma is a free IOS and Android app that allows you to snap a picture of unwanted mail you want stopped. PaperKarma contacts the mailer and handles removing you from the unwanted distribution list. It is so easy to use and all the hard work is done behind the scenes for you! Another way to reduce paper coming in is to set up an account with Catalog Choice, a non-profit mail preference company. You inform them of the mail you don't want to receive any longer - not only catalogs, but credit-card solicitations, junk mail and other unwanted mail. They handle getting you off the list so you no-longer receive the unwanted mail. Another way is to go to the official Consumer Credit Reporting Industry website and complete their on-line form to opt-in or opt-out of firm offers of credit or insurance. The Direct Marketing Association charges $1.00 to remove your address from their lists and once your information is in their database, it cannot be sold to other companies. A person must renew every 5 years. You can see, with a little work, there are ways to significantly reduce, if not eliminate unwanted mail coming to you. Your shredder may soon be collecting dust!